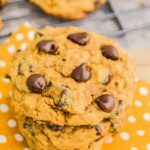 These Pumpkin Oatmeal Chocolate Chip Cookie are the PERFECT fall cookie and a must for your fall baking list. 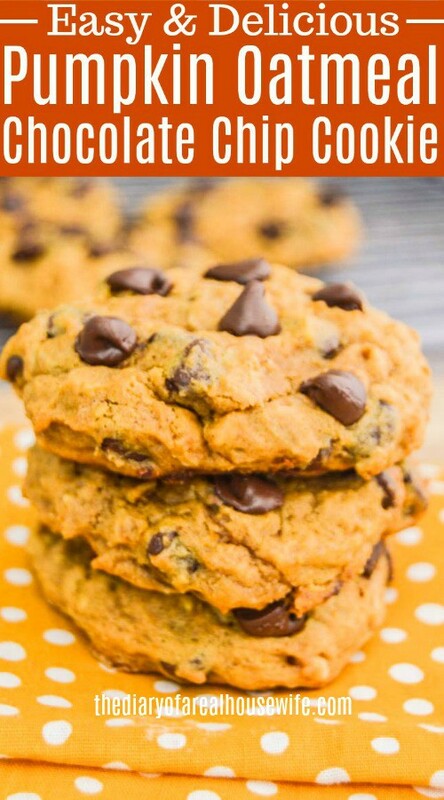 Full of fall flavor and chocolate chips, these cookies will quickly be a favorite! Give me all the pumpkin! The coffee, the cookies, the bread, and candles, I want it all! And since the official start of fall is just two days away I am jumping in with both feet and doing everything pumpkin. This time of year is my favorite. Always has been and always will be. The weather is perfect, the scenery is beautiful, and the food is my favorite. I could go on and on but I think you get the point. I’ve started searching around Facebook for events near me and I plan on attending at least 101 fall festivals this year and going to every pumpkin patch within a 50 mile radius. Plus when you live in the blue ridge mountains the fall is more beautiful then any place else. I make a lot of fun fall treats but these are by far my favorite. Usually, I have some good self-control over all the baked good in my house. I can stay away from a cookie for a while before feeling really tempted. 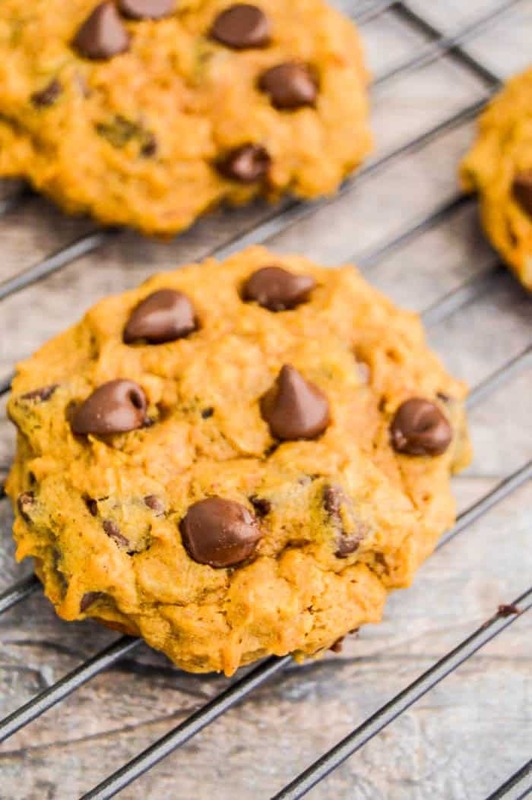 These Pumpkin Oatmeal Chocolate Chip Cookie where a different story. They are so soft and moist and just perfect. What is on your fall baking list this year? 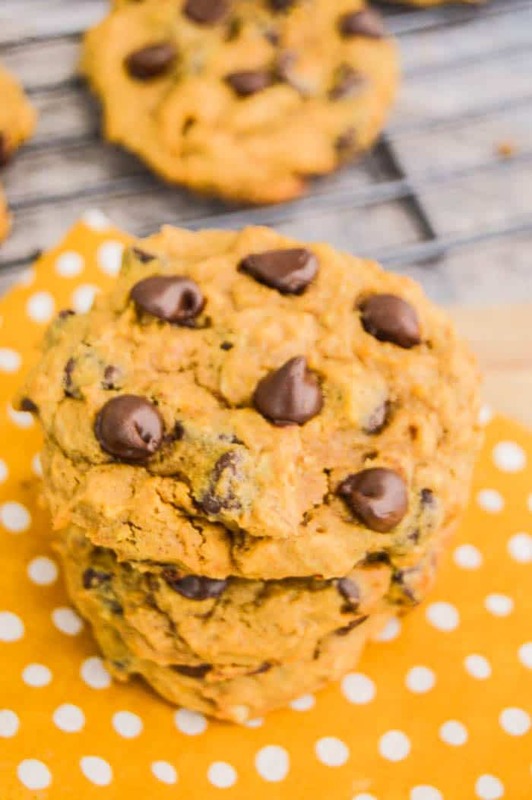 Can you add pumpkin to just about anything and love it like I do? 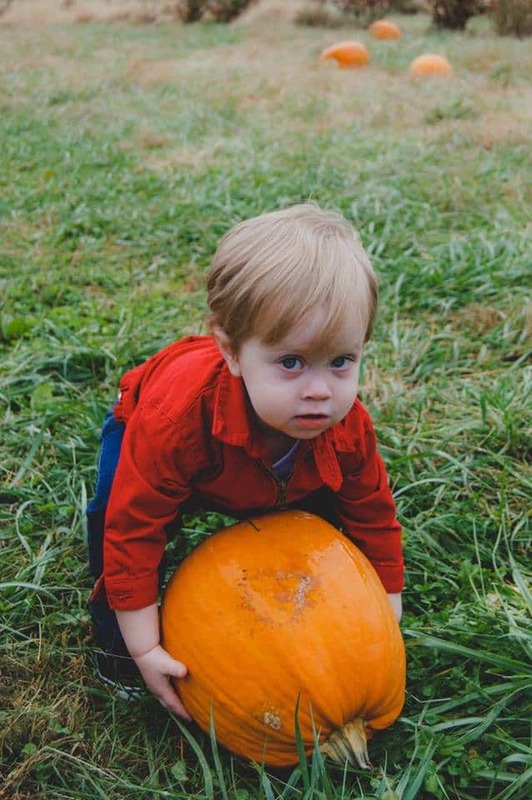 I can’t wait until we head back to the pumpkin patch this year! Look how little my E is here! 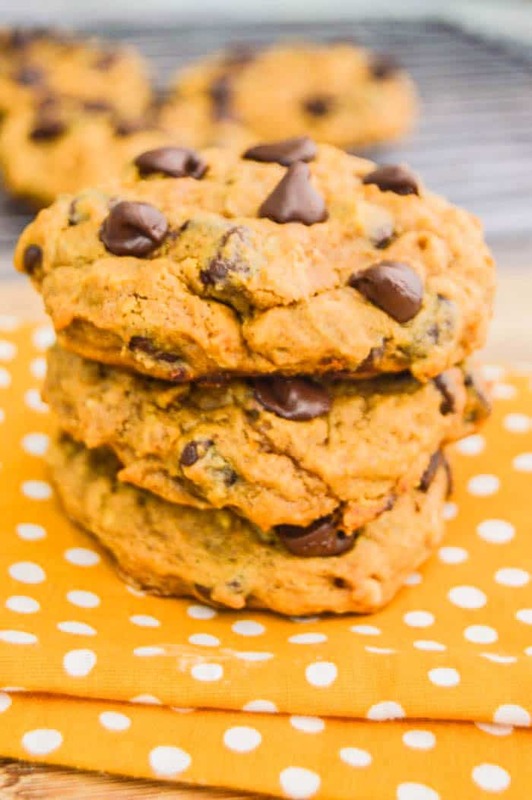 Chocolate Chip Pumpkin Muffins: Nothing better for breakfast in the fall! 2 Ingredient Pumpkin Spice Muffins: If you are in need of a SUPER easy recipe idea you have to check this one out. Chocolate Chip Pumpkin Bread: What can make the best pumpkin bread even better? Loading it up with chocolate chips. Preheat oven to 350 degrees F. Prepare a cookie sheet with nonstick spray or parchment paper and set aside. Start by whisking together your dry ingredients, flour, oats, salt, baking soda, and pumpkin pie spice. Set aside. In a stand mixer or in a large bowl with a hand mixer cream together butter and sugars (white and brown). Mix until creamy, smooth, and well combined. Add egg, vanilla, and pumpkin puree. Slowly add in dry ingredients mixing until combined. Fold in 1 3/4 cup chocolate chips. The dough is very sticky so it will need to chili. Place in the fridge to chill for 1-2 hours or until dough can be formed into balls. Roll out cookie dough balls and place on prepared baking sheet. Place reaming chocolate chips on the tops of each cookie. Bake for 12-13 minutes. Allow cookie to cool on baking sheet for 5-8 minutes before removing to cool on a wire rack.